"Prices fluctuate more than values – so therein lies opportunity"
Investors can earn superior returns by reading the price-implied expectations in stock prices and correctly anticipating revisions in those expectations. Expectations Investing provides the tools investors need to read expectations and anticipate revisions of those expectations by manipulating the traditional discounted cash flow model, and by bridging the gap between valuation and competitive strategy. 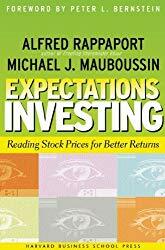 Expectations Investing: by Michael Mauboussin and Alfred Rappaport, provides investors with a fantastic framework upon which to make critical investing decisions. The book is a quick read, and the core concepts are relatively straightforward to apply, especially for investors with previous valuation experience. It’s critical today to be able to understand what expectations are embedded in a stock’s current price (what’s priced in? ), and this book provides a useful set of tools to estimate these price implied expectations. One question I always ask in my personal investing process is, how does the market view my target?. Expectations Investing also bridges valuation (through the expectations investing framework) with competitive strategy analysis and the evaluation of management decisions. The expectations investing framework uses the future free cash flow performance implied by the stock price as a benchmark for decision making. The author’s argue (and I would agree) that this is a lot more useful than either struggling to forecast these future cash flows, or using poor short-term valuation proxies like P/E ratio’s. In order to correctly anticipate revisions in expectations, investors need to understand the framework of what drives shareholder value. The author’s detail the relationship between value drivers, (influenced by) value factors, (influenced by) and value triggers. The three main triggers are sales, costs efficiencies, and investment efficiencies, and you can determine the influence that changes in each of these areas will have on the price of a stock by tinkering with them in your model. Investors should focus on the area with the largest expectations revision potential, which is usually sales. It’s also important for investors to analyze historical competitive strategy and financial performance, and to compare them with the future performance implied by the price. Evaluate the industry, the competitive environment, and the company’s historical performance to determine whether or not the price implied expectations are reasonable. Investors should also strive to mitigate the effects of behavioral traps such as overconfidence and anchoring. Always allow for a margin of safety, don’t overestimate your abilities, challenge your estimates, and seek feedback from others. Chapter 7: Buy, Sell, or Hold? If the range of expected shareholder values (between bull, bear, and consensus case) is high, a stock can be attractive even when the consensus is the most likely outcome. Finally, make sure to account for taxes! This chapter details how investors can value real options for future company projects, essentially using the Black-Scholes option pricing formula. This is useful for valuing companies with very uncertain outcomes like start-ups, which traditional DCF analysis tends to undervalue. Remember to always consider the potential moves of competitors when valuing the real options of a company. The fundamental principles of economics have not changed, and we do not need new rules for value. There are three main categories of businesses, physical, knowledge, and service, and they can each be understood through the lens of of the value factors in the expectations infrastructure (volume, price, mix, operating leverage, economies of scale, cost efficiencies, investment efficiencies). Understanding the characteristics of these categories can help investors anticipate expectations revisions. Traditional EPS accretion/dilution analysis of mergers and acquisitions is useless. Investors should instead focus on shareholder value added and Shareholder Value at Risk, or SVAR. For the acquiring company this is equal to the present value of synergies less the premium paid. SVAR shows acquiring shareholders what percentage of their stock price they are betting on the acquisition. Investors can also gauge management’s confidence in the deals by analyzing the consideration; typically all cash deals imply a higher confidence level because the acquiring shareholders take on all the synergy risk. The choice between a cash and stock deal can also signal to investors if the management of the acquiring company thinks their stock is over or undervalued. Share buybacks can tell attentive investors a lot about a management team’s view of a company. There are different reasons for share buybacks, some that send positive signals, and some that send negative ones. If management is buying back stock because they believe it is undervalued this is likely positive, conversely, if management is buying back stock because they ran out of investing opportunities, or they’re trying to hit EPS targets, this is probably a negative sign. Is this the appropriate threshold level? The trade-off to keep in mind when evaluating a management team’s measure and threshold level of compensation is that there is a trade-off between the strength of an incentive and losing an executive. 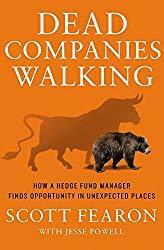 Dead Companies Walking: How A Hedge Fund Manager Finds Opportunity in Unexpected Places by Scott Fearon with Jesse Powell, is an engaging and easy read detailing experienced asset manager Scott Fearon’s investments in failing businesses (both on the short and the long side). The book isn’t set up as a how-to guide, but there are quite a few valuable nuggets of wisdom littered throughout. I did my best to distill what stood out the most to me in my summary below, but I would highly recommend checking the book out yourself! Hedge fund manager Scott Fearon starts the book by detailing his first encounter with a large market crash, the oil boom and bust in East Texas. He goes on to describe how this event, along with subsequent manias and crashes including the tech bubble in the late 90s and the housing bubble in the mid-2000s, shaped his views of markets and thinkings on failure. He describes failure as a “natural-even crucial element” of a healthy economy, and that people who are willing to accept this fact can “make a hell of a lot of money”. Through his long career in the asset management business, and experience interviewing managers to invest both on the long and short side, Fearon detailed the six most common business mistakes that lead to failure. They failed to adapt to tectonic shifts in their industries. They were physically or emotionally removed from their companies’ operations. Importantly, Fearon notes that the vast majority of executives of failing companies are neither stupid nor fraudsters, and that most are in fact intelligent and hard-working. These six common mistakes are traps that anyone can fall into, and that’s why it’s so important to understand and recognize them. Most people have a behavioral tendency to overweight the importance of recent history in their analyses (whether they be management teams or investors/analysts). Businesses move in both small and large cycles, and the latter are often ignored. Fearon’s mentor believed it was critical for investors to speak to and evaluate management teams, but to do so with a healthy dose of skepticism as they are often overly-optimistic, and prone to fall into these same behavioral traps. Falling prey to historical myopia is one of the greatest risks for value investors who focus on recent performance and financials (current multiples) to decide something is cheap, while simultaneously ignoring larger cycles, trends, and secular changes; investments of this type are often called value traps. This lead Fearon to the growth at a reasonable price ((GARP)) model, and to his focus on businesses with increasing cash flows and intrinsic values. Markets are dynamic and ever-changing, and no one formula is going to lead investors to success. Fearon described how his personal favorite GARP formula led him to miss out on early investment opportunities in both Costco (COST) and Starbucks (SBUX), because he thought the multiples were too high. This is not to say that investment formulas and standards are not useful, they are most of the time, but all rules have exceptions. One such formula that Fearon singles out, is the valuation technique commonly used by analysts of slapping a comparable EBITDA multiple on the next years projected EBITDA. He also details a couple of his personal strategies for entering short positions and describes what investors should be wary of, stating that he will generally hold off until the stock has lost at least half of the value of its 52 week high (to avoid the wrath of momentum investors and the potential for a short-squeeze), and likes his positions to have, “enough downward velocity that there’s little chance it will stop before it hits bottom”. Probably the most important take-away from this book is the too often overlooked reality that customers are the lifeblood of any business. Too often, analysts and management teams misread their customers and mix up what they would personally want, with what the what the customers want. It’s critical to understand what people in the real world want, and how they actually behave. Fearon details a personal experience with this and writes of his own failure to account for his customers when he started a Cajun restaurant in Marin County, California. “Men, it has been well said, think in herds; they go mad in herds, while they recover their senses slowly, one by one. Though we often think of the largest and most recent examples when we think of manias and bubbles, the truth is they are happening all the time, just on a smaller scale. Fearon argues that at their core, manias are about storytelling, and they happen when people convince themselves that something must be true no matter what. One common mistake that investors make is averaging down on positions that move against them. While it is true that sometimes this could just mean an undervalued stock is getting cheaper, it could also very well mean that your oginial analysis was wrong. The fact is that everyone is going to be wrong a lot, and it’s important to not keep chasing losing ideas and let them blow up your whole portfolio. As the saying goes,“Double-up, triple-up, belly-up.” Fearon believes that the best money managers are the best quitters. This advice rings true with what we’ve seen happen recently with famous money managers who became publicly attached to losing positions and poured massive amounts of money into them (ex. Ackman and Herbalife). Fearon also wrote about his time trading options in college, and detailed the four lessons he learned. In Fearon’s mind, the top personality trait of a successful investor is intellectual curiosity. It’s important to be someone who can’t accept conventional wisdom, reads vociferously, craves new ideas, and isn’t afraid to try them out and fail. Watch out for excessive leverage, especially in cyclical commodity-based businesses. Beware of lavish execs/elitism in upper management, (Fearon gives the great example of Ron Johnson at JCP). Watch out for companies that continuously make excuses and blame their poor performance on external factors or scapegoats, and check how their competitors are doing. This next quote also rings especially true as of right now, (TSLA) anyone? And lastly, be wary of growth driven primarily by acquisitions. This growth can often serve the interests of management teams more than the interests of shareholders. Despite his success on the short side, Fearon has made the majority of his money on the long side. He presents some compelling reasons why short-selling isn’t as attractive as it used to be, along with a few tips for investing on the long side, which he argues will always be the best way to earn outsized returns. Investors have gotten better at short-selling and the competition for good shorts is high. Don’t average down, and don’t sell your winners too soon. Stay humble; recognize your own failures and learn from them. And finally, Fearon recommends that investors look in less efficient areas of the market (small/microcaps), and keep from growing too large. He next details why he thinks most people in the financial world are terrible investors. It’s important to recognize that failure is a normal and natural part of business and the financial system. The markets collective fear of failure has led to extreme policies like the tax payer bailout of the financial system in 2009, along with the simultaneous push to near 0% interest rates by the federal reserve. 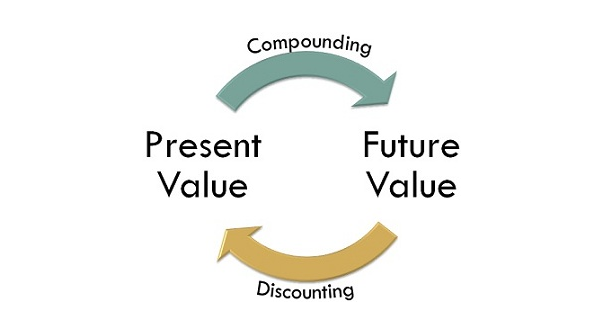 My journey down the never-ending value investing rabbit hole…Passionate about compounding knowledge and compounding returns. Find my stock picks/research on Seeking Alpha. Passive Index Investing: A Bubble Bound To Burst?